To Provide You with the Best and Safest Crane Operation. Bar None. Our Safety and Health Handbook has detailed information about our safety policies. Take a look if you would like to learn more. The Allegheny Crane team puts a very strong emphases on caring for our environment. A lot of companies say they do this. But really, a lot of the time that's just to give themselves a good image. Kyrk Pyros and his team have been integrating environmental awareness in their work since the very beginning. This starts with training our employees about environmental issues that may affect their work. We put the time in before each and every job to make sure we are not only avoiding environmental dangers, but also actively seeking to make a positive impact. 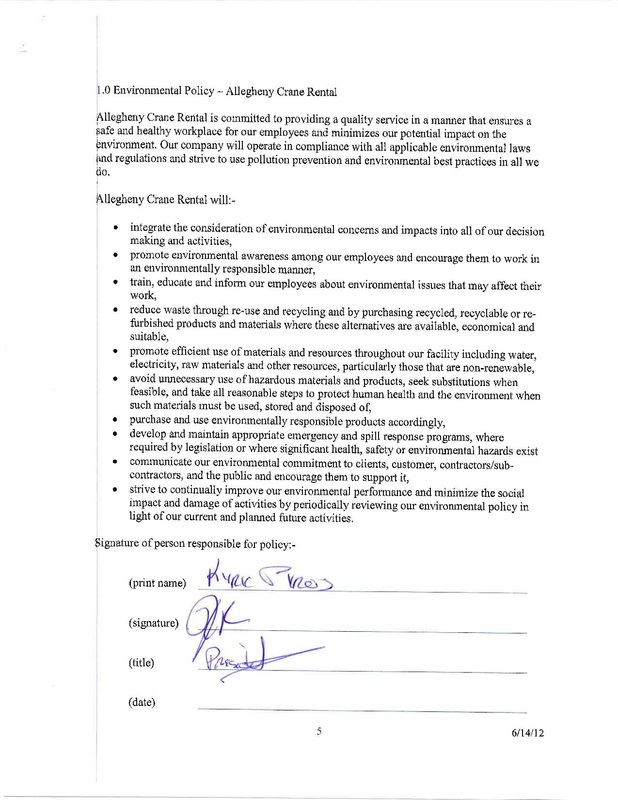 ​To learn more about the specific steps we take to make a difference, read our Environmental Policy to the right. Allegheny Crane Rental is constantly pushing to utilize the latest technology and advanced equipment available in the market today. Our top flight mechanics constantly maintain our equipment to optimize uptime and keep you running. "It is truly an honor to watch Kyrk and his team combine the construction and crane companies to work in unison. The lift went flawlessly: on time - on budget." -John Matthews, A-Air Company, Inc.
"Under the masterful tutelage of Kyrk Pyros and Allegheny Crane, we could not have asked for a more professionally done and safety oriented extraction. In a word, these professionals had class"